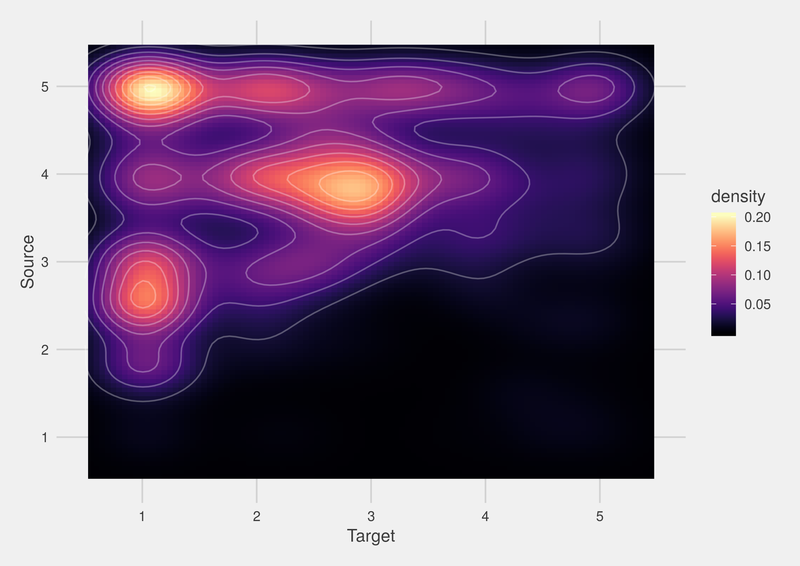 Heatmap of frequency of source and target language of loan events in our data, defined by language power and population size (from 1-5). Graph by Johan Frid. In the previous blogpost, I started a compilation of safe loans from and into Tocharian. I will continue this work in the next post. In this post, I will talk about loan directionality, since I am currently completing a paper (with several co-authors) on lexical borrowability in Eurasian languages. I want to say a few word about this project. We have compiled and extracted all loan events in the lexical database, and tested various statistical measures on this data. Worth noticing is the directionality of loans in contrast to language power as well as the differential source languages of the families. As I have described in recent posts, our data set on lexical data compiles culture concepts, i.e., words for farming, technology, hunting, and war, which have a presumed age that go at least back to the Chalcolithic. This means that this vocabulary is not representative for the entire lexicon, only these specific domains. Loans are also extended over long periods, at least back to antiquity. If we look at the source languages, we notice that they differ between families. 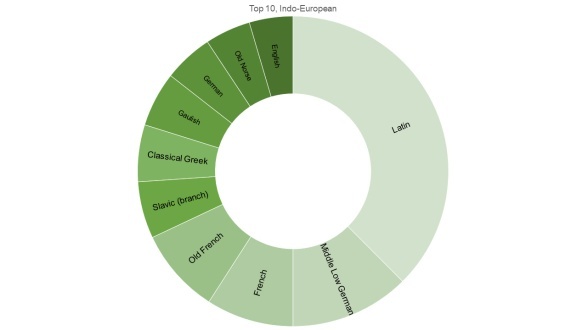 In Indo-European, Latin is most frequent, followed by Middle Low German, French, Old French, Slavic, Classical Greek. In Caucasian, Turkic languages dominate, followed by Persian, Georgian, and Arabic. 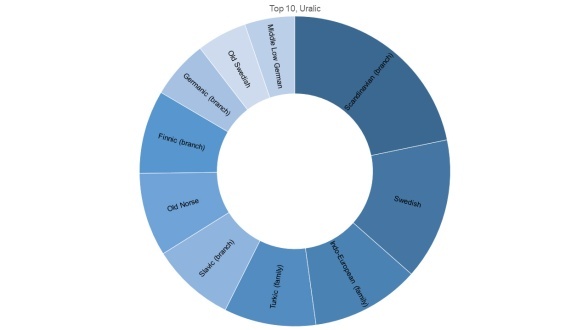 In Uralic, Scandinavian languages dominate, which is mainly due to the fact that our Fenno-Ugric languages dominate in our data (see pictures below). The correlation between loan directionality and language power and populations size is also noteworthy. We define the power of languages by a quantitative rank based on several features, including literary power, economic power and population size. This we plot against the occurence as source and target language in loan events (see graph above). All languages are equally likely to be target languages, but the most powerful languages are more likely to be source languages. This is a significant correlation. The most frequent loan event is from a very powerful language to a very weak. The second most frequent language is from a medium powerful to a weak. The third most frequent loan is from a medium powerful to a medium powerful language. In scrutinizing the data, we observe that this type of loan event is almost entirely restricted to the middle ages, which is also an interesting result. Unequality between languages seems to be specific to the antique and modern periods, whereas language contact in the middle ages was more distributed between languages of equal power. 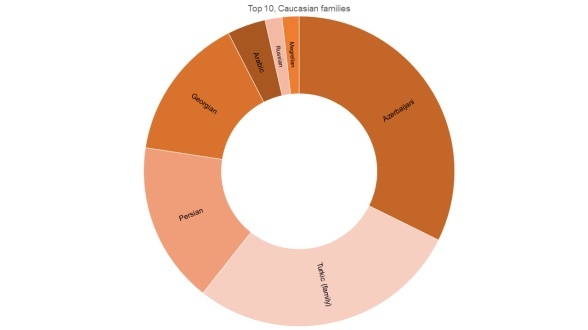 Graph illustrating the most frequent source languages in Indo-European (top), Caucasian (middle), and Uralic (bottom) families.